Lophium mytilinium (Pers.) Fries. Zogg (1962). The genus Lophium is characterized by carbonaceous conchate ascocarps, sometimes seated on a foot-like base (Zogg 1962), or sessile directly on the substrate. 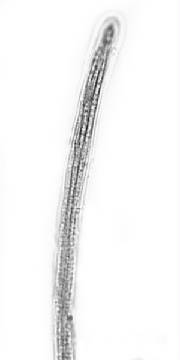 The thin-walled scleroparenchymatous peridium encloses a basal hamathecium of narrow trabeculate pseudoparaphyses, with very elongate asci, each bearing one fasicle of transversely septate filiform ascospores, often spirally arranged. The type species, Lophium mytilinum (Pers.) Fries, is cosmopolitan in the temperate zones and has been recorded from both sides of the Atlantic (Barr 1990; Zogg 1962). Zogg (1962) described two additional species, L. elegans Zogg on Juniperus from alpine regions of France, Italy and Switzerland, and L. mayorii Zogg on Pinus and Larix from the Swiss and French Alps, noting that L. mayorii differed from other species of Lophium in having rigid, band-forming ascomata. Vasilyeva recently (2001) found the same fungus in the Russian Far East and stated that it differed sufficiently from other species of Lophium in having gross, erumpent crowded ascomata, band- or ridge-like in appearance, as compared to the smaller, fragile, and entirely superficial fruitbodies typical of species of Lophium and made the transfer to Zoggium mayorii (Zogg) Vasilyeva (Vasilyeva 2001). Like the genus Mytilinidion, species within the genus Lophium have only been recovered from coniferous substrates. The sole exception is the recently described Lophium igoschinae Chlebicki recently recovered from Dryas octopetala and D. crenulata (Rosaceae) from Russia and Greenland (Chlebicki & Knudsen 2001). In a recent molecular phylogenetic study, Boehm et al. (2009) were able to obtain two isolates of L. mytilinum from the United States (Michigan and New York), with 70 years separating their collection (see Table 1, below). We were also able to include in this study sequence data for the nuSSU and nuLSU from another L. mytilinum isolate from Sweden (CBS 114111) from GenBank (Table 1). Surprisingly, although these three isolates were in the same clade with species of Mytilinidion (Fig. 3, below), they did not show any particular connection to the scolecosporous species surveyed belonging to the subgenus Lophiopsis, once thought to form a transitional group to the genus Lophium (Lohman 1932b). Lastly, it was concluded that the genus Lophium actually preceded the genus Mytilinidion sens. lat. (Fig. 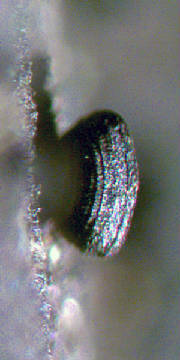 3), with the filiform spore preceding the phragmospore (Boehm et al. 2009). Note: L. mayorii was transferred to the genus Zoggium (Vasilyeva 2001). Fries, Syst. Myc.. II, 1823, 533-534. Common, cosmopolitan world-wide in coniferous forests (Europe & North America). Collected from bark & stems, dead wood & cones of Pinus, Larix, Picea, Abies & Juniperus. Lophium mytilinum (Pers.) Fr. Photo credits: Alain Gardiennet. Zogg, Ber. Schweiz. Bot. Ges. 64: 139-141. 1954. Rare. Europe (Italy, Switzerland, Southern maritime France). Recently collected from near Dijon, France on living & dead Juniperus. Ascomata upright, but with a less prominent stalk as compared to L. mytilinum. 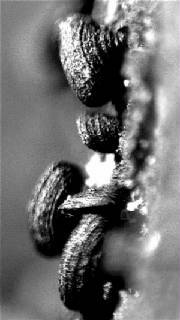 Ascospores very long scolecospores as L. mytilinum, but in ascus arranged in spiral parallel configuration. According to Zogg, the mature ascospores are actually part-spores, breaking up at maturity. The mature spores are slightly pigmented; a plae yellow, and measure ca. 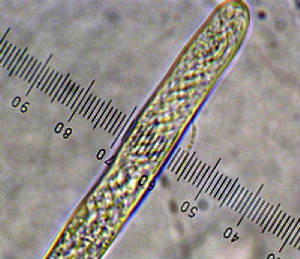 1.5x larger than ascus when fully extended; spores measuring (200) 260 – 280 (300) x 2 μm. I have not observed the ascospores of L. elegans to become part-spores. Upon release they do assume a length longer than the ascus, but have not been observed to fragment. Lophium elegans Zogg. Left: Zogg (1962). Photo credits: Alain Gardiennet. 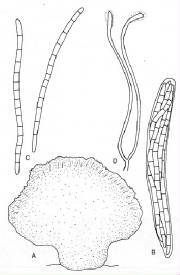 Note spiral arrangement of spores in the ascus, as compared to L. mytilinum. Acta Societatis Botanicorum Polonniae 70: 295. 2001. Chlebicki & Knudsen (2001): “Ascomata superficial, conchate, laterally compressed, surface black, irregularly granular or undulate, apex cristate with longitudinal slit covered by very small papillae, asci cylindric 90-97 x 8-9 μm, spores filiform, with obtuse ends, 12-15 sepate, pale yellow 78-86 x 2.6-3 μm, trabeculae sparse, filiform, simple or branched in lower part,, with thickended ends, in gelatinous matrix. 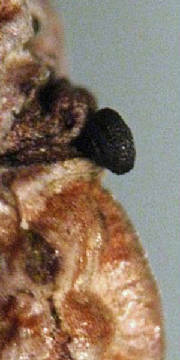 Spores of the new species resemble those of L. mayori, but its apothecia are distinctly smaller. L. igoschinae is the first species of this genus which has been found on non-coniferous substrata”. Collected on the veins of lower and upper surface of dead leaves of Dryas octopetala from Russia, the Polar Ural Mts., and from Greenland, as well as from D. crenulata from the Tchukotka Peninsula, Russia. Lophium igoschinae Chlebicki. From Chlebicki & Knudsen (2001).